Update: Southwest wrote about this blog post in their in-flight magazine a couple months later. Cool! I cried a little on a plane last week. It wasn’t due to a delay, an uncomfortable seat, or peanut salt getting in my eye. It was because I saw a shining example of “social business” at work in the real world. Mid-way on a Southwest Airlines flight home from a speaking engagement in Ft. Lauderdale, I looked up from my laptop to find Becky the flight attendant standing at the front of plane with a boy of about 9. The kid was absolutely BEAMING with pride and accomplishment and happiness and honor. Abraham returned to his seat. Becky broke out the medical kit, ripped open a band-aid and used it as ersatz tape to post the picture on the wall. A few minutes later, Abraham was back with a second picture. A landscape this time, Becky again made an announcement and grabbed another band-aid. When I talk about focusing on BEING social, rather than focusing on DOING social media, this is what I mean. And it’s about building loyalty and triggering word-of-mouth by doing it well. Will Abraham’s parents ever fly any other airline? Will he? Will I? Or you? For companies that are social at their core, social media just lets the rich get richer. For companies that don’t truly believe in the primacy of the customer, all the Twitter and Facebook and blogs and YouTube in the world won’t change their fortunes. Social is foremost a philosophy, not a set of behaviors. And actions speak louder than words. Southwest included a story about Becky and this blog post on their Nuts About Southwest blog. Becky was featured in the company’s Employee Newsline podcast, put out every week by CEO Gary Kelly. Transcript: And finally, for this week’s “Own It” moment, I’d like to recognize Baltimore-based Flight Attendant Stephanie “Becky” Terry. Recently, a blogger posted a wonderful story on his web site of how Becky made a difference for one of our young travelers. 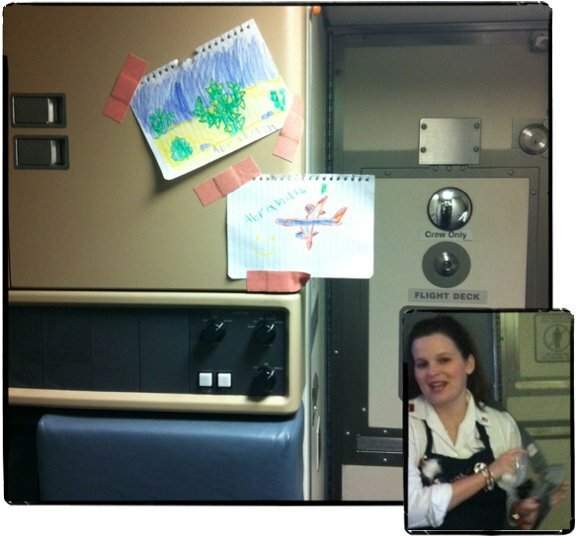 On a recent flight out of Fort Lauderdale, Becky called a young boy up to the front of the plane and made an announcement on the PA that we had a “famous artist” on the flight. Becky had noticed that the young man was drawing a picture during the flight, and she asked if she could share it at the front of the plane. As the boy returned to his seat, Becky broke out the medical kit, ripped open a band-aid and used it as an ersatz tape to post the picture on the wall. And, a few minutes later, the boy was back with a second picture, and Becky again made an announcement and grabbed another band-aid. As you can imagine, this just made his day, and it made an impression to the blogger who happened to be onboard. This is just another great example of how you all make special moments for our Customers on a daily basis. Way to Own It, Becky!